After facing backlash for publishing a piece with a misleading headline maligning U.S. Ambassador to the United Nations Nikki Haley, The New York Times has issued a correction and changed the title. The previous headline suggested that Haley and the State Department spent over $52,000 for curtains for her Manhattan residence, painting a picture of frivolous spending and misuse of taxpayer funds. Yet, it is stated within the article that the curtains were purchased during the Obama administration, not by Haley nor the Trump State Department. 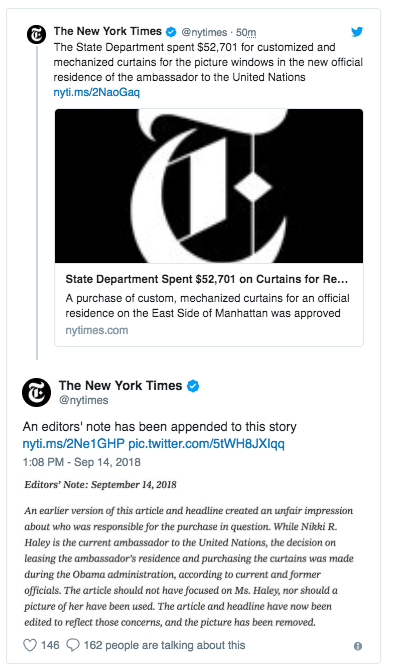 The Times, seen here in all its deceptive glory, article ran under the headline: 'State Department Spent $52,701 on Curtains for Nikki Haley’s Residence.' Except that neither she, nor the Trump State Department, were the ones that bought the pricey drapes -- the Obama administration did. The Times notes that Haley is the first UN ambassador to live in the penthouse, unlike former ambassadors who lived in the famous Waldorf Astoria hotel. But the Times also admits in their own article that the nearly 6,000 square-foot space, listed for $58,000 a month, was first leased in 2016 by the Obama administration as the UN ambassador's residence after the Waldorf was bought by a shady Chinese company. The Times also notes, contrary to its own misleading headline, that the Obama State Department was responsible for ordering the curtains, which just happened to be installed last year after Haley had already taken over the ambassadorship. No wonder President Trump calls The New York Times "fake news." They just made his argument for him.